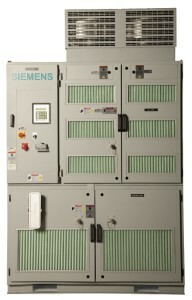 East Coast Electrical Equipment Co. is now an authorized Siemens/Robicon medium voltage VFD stocking distributor! 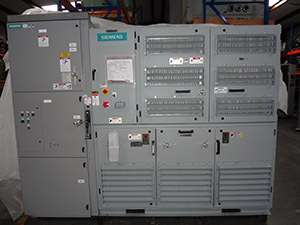 We have in our stock new Siemens/Robicon Perfect Harmony VFD’s at 140 and 260 amps rated for either 2300 or 4160 volts. These drives cover from 200 hp to 2000 hp. These drives are your perfect solution to retrofit your existing motor to operate with a vfd as these drives will work with any motor regardless of age or brand. No shaft grounding brushes or insulated bearings are required. This avoids expensive motor modifications or the need for a new motor. The Siemens/Robicon Perfect Harmony GenIV Air-Cooled drives from Siemens are designed to provide versatility, efficiency, and process availability. Near perfect sinusoidal output allows retrofit to existing motors without the use of an output filter. Multi-level PWM technology means no special motor is required. Clean power input (meets IEEE-519). 0.95 power factor throughout speed range. Can be applied to induction, synchronous, and wound rotor motors. Short circuit and ground fault protection. Loss of line voltage protection. Over-temperature protection (VFD and motor). Over-speed and stall protection (Motor). Self-diagnosis of control and power cell. Click Here to download PDF of a short overview of the Siemens/Robicon Perfect Harmony GenIV.